Marketing helps overcome objections and inform at the same time. Marketing is not a 30-second TV commercial. That's advertising. Advertising is only part of an overall marketing strategy. Marketing is more big-picture (just like safety) that includes positioning, reputation, reliability, communication, focus-groups, user-feedback, price, cost and so much more. Safety buy-in doesn't happen by accident. When you employ safety marketing as part of your safety plan, you help overcome barriers, objections and resistance to the safety program through a series of purposeful communications. In order to build a safety culture, you must connect with each corner of the organization. Establish an overall corporate culture that includes safety throughout every department. Safety is not reserved only for those with certification. Safety is meant to protect everyone. Everyone should be involved. Safety has to appeal to every single person in the organization in a way that they can comprehend and ultimately buy-in to. Advertising (you know, the TV commercials part) is one small cog in the wheel of the overall marketing concept. Logos and slogans can either make or break a campaign. Nike’s Just Do It® was the result of years of research and preparation. The white Apple logo with no words took years to perfect. Marketing is a science with most of its work behind the scenes before anyone ever sees the result of all of that work. Safety First and Be Safe are not safety marketing campaigns. They do not create an easy affinity with the end-user. There is no ownership of those message. They're generic. People can’t choose Safety First when they feel that what is being measured is production. Be Safe is not a complete set of instructions. It does not instruct in what to do. And gruesome photos of injury do not create a warm fondness for safety. They create fear and intimidation; neither of which creates trust and respect. So you are aware, you will not come up with a winning safety campaign in a single meeting - at least not something that will work for you long-term. It may take months to develop a focused message that resonates. 1Create a bond of ownership. People have to feel proud to own the brand they choose before they choose it. The messaging and the words have to connect personally. The words have to be short - under 7 in total. The colors and logo design have to be attractive to the audience. Make an impact. Use as few words as possible to make a statement. It's easy to remember a few words. Once you connect with pride of ownership, it’s tough to change their minds. Once they buy-in, it’s unshakable. 2Look beyond the narrow focus of safety. In other words, don’t make the campaign just about safety. Create something that front-desk receptionists, IT guys, and salespeople can get behind. You are not just attempting to change safety culture. You’re changing the corporate culture with safety being one of the foundational values. How you do business, and especially safety, can be your competitive advantage. Can you connect your safety campaign with hiring, sales and new business? 3Be everywhere. Once you have decided on your message, it must be everywhere and integrated into every corner of the organization. From banners on shop floors to logos on the back of vehicles to crests on coveralls to stickers on hard hats, to paper coffee cups in lunch rooms. Everywhere an employee looks, there should be a reminder of how we do safety around here. The marketing message will begin to seep outside of the walls. It will find its way into the hands of job-seekers, customers, and contractors. They will measure themselves against your message to determine their fit. As an example, a company with values that include safety, respect, courtesy, integrity, pride, and service might include a simple I AM as their campaign. (I am safety, I am respect, etc.) It’s easy to measure yourself against those values at any moment of the day. The key is to connect employee pride to the marketing campaign. If you can make people proud to connect, they will engage. Safety ensues. Kevin Burns is a management consultant, safety speaker, and award-winning marketing consultant. 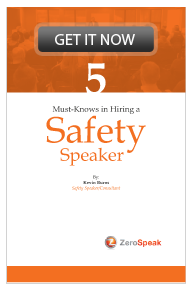 He is the author of "The Perfect Safety Meeting" and the #1 Amazon Health & Safety Bestseller, "Running With Scissors - 10 Reasons To Invest in Safety In Slow Times." Kevin won the prestigious Retail Council of Canada Marketing Award in 1994. He is an expert in how to get through to people - how to talk with them so they hear and understand. Kevin's presentation "Trust The Process - Instill A Safety Attitude To Build An Engaged Culture Of Safety" will help your organization reach the following goals: better engagement and buy-in to safety, increased teamwork, better communication, lower turnover resulting in increased profits from production. Click here for more information and to discuss your needs with Kevin.